You guys are unreal. 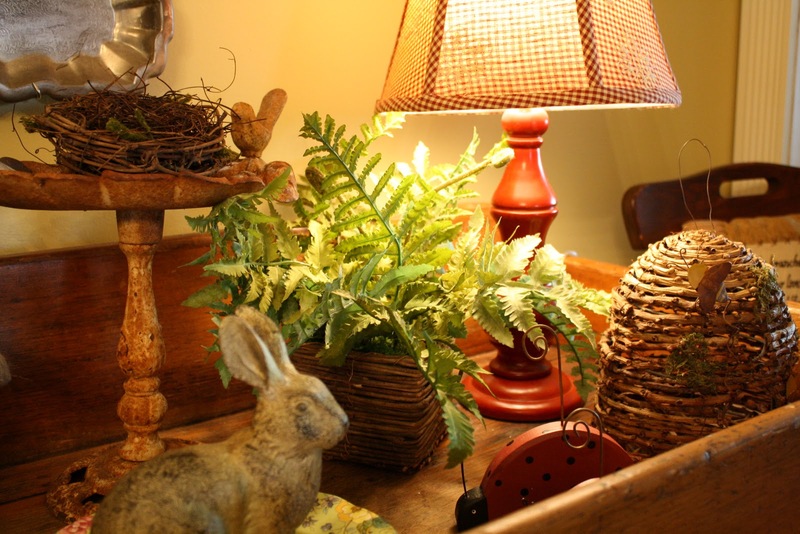 We have had so many fabulous vignettes and inspiration displayed at the Table Top Tuesday parties. Each week I just drool over all of them. Thanks also for so many joining. That makes it so much fun. I am still making the rounds, but here are a few that caught my eye. I know you will love them all. I love everything about her house. Look at this fabulous PB Inspired vignette. I love this beautiful chest and just look at the dough bowl, books and flowers. She even did a beautiful vignette under the chest. You really have to go check out Confessions Of A Plate Addict, her home is to die for. Besides, she is also one of my dearest friends in the whole world, and such a very special lady. If you havn't visited Pickets Place you are missing the most wonderfully decorated home you will ever see. She is so creative. 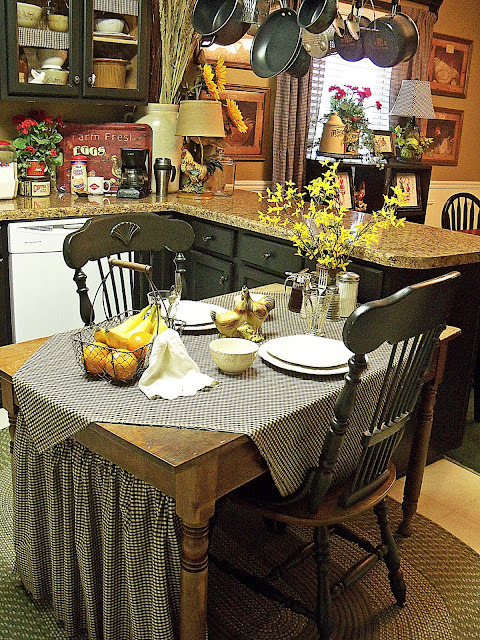 She replaced the kitchen island with a table and chairs. How fabulous is that and just look at all of her vignettes. Drool. She is the sweetest and dearest person, and you will love reading her blog. Full of love, hope and blessings. You know how much I love silver and look at the beautiful bouquet arranged in the champagne bucket. Just look, there are apples in the base of the arrangement. You need to go see the whole tablescape at Mr. Goodwill Hunting. Wait until you see all of the stunning Easter vignettes. She has created so many beautiful ones and she uses the most wonderful vintage items in her displays. Be sure to go visit Sunny Simple Life, I know you will find tons of inspiration at her blog. Just look at this gorgeous vignette. White and glass and it is absolutely stunning. You definitely want to go check out Olive Out. She is always so creative. I love her laundry redo. So pretty and she's used some beautiful vintage items in such a creative way. Such a talented lady, so don't miss Common Ground. You will definitely find a ton of inspiration. Look at this fabulous garden setting. Wouldn't you love to sit here and enjoy the outdoors and a wonderful refreshment. I love the use of the spindles for candlesticks and all the architectural elements. Unreal. You really do have to go see Home Is Where The Boat Is. These are each so pretty...heading off to visit! Thanks so much for your party and for sharing highlights! Love them, and thanks for giving us links to other fun places. Much like you, I'm still making the rounds of your wonderful participants! I'll be sure to check out these blogs in full detail! Thank you, sweet blog friend, for this wonderful weekly meme!Inspiration abounds! Your table tops are always fabulous and I have loved every one of them, you inspire me to do table settings and make each meal a treat. I think your displays are gorgeous and I love alot and I love simple, I wish I could move stuff around more frequently, instead I tend to only change things when it's a holiday!! I loved the all white and glass one, so unique and different. I will have to go check out all those blogs!!! I didnt even know I was featured today on Marty's Blog. Love these, Marty! Thank you for hosting this fun party! I get so much inspiration from these talented bloggers. Marty, I think you are amazing, you are the best host of any linky party in blog-world,you always go to every blog and have such sweet comments, and then you follow-up with highlights, Let me say I think you are awesome! You are "the hostess" with "the mostest",it is a pleasure to link up on TTT. Thanks for sharing all these goodies with us, and thank you so much for hosting each week. I am LOVING the blue and white with the little birdies. . .
hope it's a blessed day! Marty, THANK YOU for these. Now that I'm finished teaching, I hope to have more time to find inspiration for around the home. You gave me some great places to start. Beautiful tables! I wish they were all mine! LOL!!! Thank you for your sweet comment and visit today! I've a post ready for Tabletop Tuesday with more bunnies! See you soon! I need to take time and visit more of these beautiful blogs, and get some inspiration. I am so far behind and my environment shows it also. I don't participate often, but want to say "Thanks for being a great hostess". You are appreciated. Hi lovely lady~~~I love the Beauitful pictures. I have post my Tablescape on your Tabletop Tuesday. Thanks so much you are so sweet. What a great group you featured Marty, they all have wonderful blogs and I so thrilled for them! All I can think of to say is: WOW! What a great group of ladies with a lot of talent. You can tell they love their homes and love to share. Thsnks for highlighting them for us to see again. Thanks for sharing all of these talented bloggers. I'm always amazed at how wonderfully artistic that each and everyone of them are and how they can put together the most beautiful rooms and vinettes. Love these vignettes. Can't wait to go explore some of those blogs. Thanks for treating us! Ohhh yes...each and every one of these homes and vignettes are absolutely gorgeous!!! Mouth watering, eye candy...for sure! Thank you for showcasing these fabulous designs for us today, dear friend! I hope that my note is finding you and your sweet family all doing well, my friend! I have been a bit out of pocket lately and sure have missed joining in with your TTT party. Hopefully next week! Take care, dear friend! First of all, let me say that you do NOT "always overdo"!!! No way, Jose'! Thanks for featuring all these special posts. Some of them I'm very familiar with but several are new to me & I'll spend hours visiting. Martie these really are some wonderful posts to highlight. They are so pretty, and so many I've never seen before too. Yay! I am going to visit several of them right away. Thanks for the heads up! Marty, my ugly tabletops have been the same since late February! Shame on me! I love your review. I am going off to visit Home is Where The Boat Is. I adored that one. You are so great! So pretty, I've been so caught up in the big things like painting walls lately that I forget what an impact a small vignette can make in creating a cozy feeling.